After reading the comments on the Forums, Facebook and by E-mail we have revised our plan and are now getting ready for the launch. 1) We already have a bunch of the required 3D models made which will speed up the process to molds. 2) North, South, and CEF models can be used in any faction as allies and are the iconic factions of the game. 3) This allows us to place a reliable delivery date of November 2015. We have also amended our plan to give stretch goal rewards to all Core Starter Set Backers. We believe that being an early supporter should be encouraged so we are setting our reward levels so that the early Core Starter Set Backers will get their rewards shipped out in the first wave. Sign up for the Core Starter Set early to lock in your shipping order and watch as stretch goals bolster your forces! The first goal of this Kickstarter is to fund the molds required to make a new two player starter set including 16 high quality plastic miniatures, with four different models from 2 factions. Our old two player starter kit only included 6 pewter miniatures and had a high price point due to the material costs. Plastic has a very high mold cost, but a low material cost, as Backers help us cover the mold costs we'll be able to put more into the start set. Further stretch goals would allow us to upgrade it and transform it into our desired plastic starter set of 46 miniatures, including a variety of eighteen different models from 4 factions and up to four players. Reaching all our stretch goals will allow us to give our Backers even more, with 52 miniatures, twenty-four different models, for the cost of the Core Starter Set. All unlocked models will also be available at a special price for this Kickstarter to all backers as add-ons for purchase. The Kickstarter will be going live the week of October 20th and we look forward to your support. 16 plastic miniatures (1 Northern GP Squad of 4x Hunter Gear, 1 Northern Strike Squad of 4x Jaguar Gear, 1 Southern GP Squad of 4x Jager Gear, 1 Southern Strike Squad of 4x Black Mamba Gear), plus Stretch Goals. Up to 52 miniatures in the Core Starter Set when all Stretch Goals are reached. 1x Heavy Gear Kickstarter Backer 2014 Patch (4”x 2” with Iron-on backing). Free Quick Start Rulebook ebook (stretch goals include upgrades to printed b&w or color book). 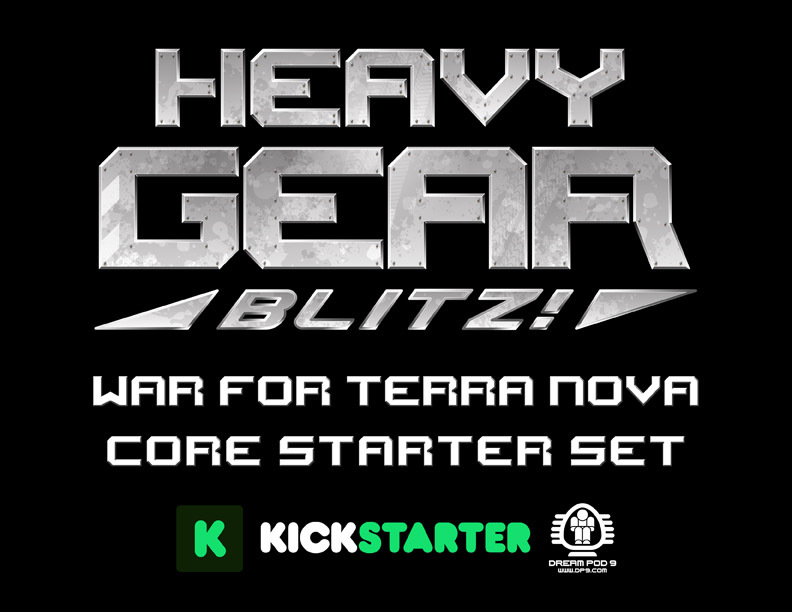 Free New Edition Heavy Gear Blitz Core Rules ebook (Living Rulebook, with print on demand option). Free Downloads: Player Reference, Game Tokens, Stoneheads Terrain, and Badlands Terrain sheets. $33,000 CAD Stretch Goal 1: Unlocks Northern Grizzly Gear and adds 2 to the Core Starter Set. $39,000 CAD Stretch Goal 2: Unlocks Southern Spitting Cobra Gear and adds 2 to the Core Starter Set. $45,000 CAD Stretch Goal 3: Unlocks CEF MHT-95 Hovertank and adds 2 to the Core Starter Set. $51,000 CAD Stretch Goal 4: Unlocks CEF FLAIL Infantry Squad (3 FLAIL minis each) and adds 2 Squads to the Core Starter Set. $57,000 CAD Stretch Goal 5: Unlocks Northern Cheetah Gear and adds 2 to the Core Starter Set. $63,000 CAD Stretch Goal 6: Unlocks Southern Iguana Gear and adds 2 to the Core Starter Set. $69,000 CAD Stretch Goal 7: Unlocks CEF F6-16 Frame and adds 2 to the Core Starter Set. $75,000 CAD Stretch Goal 8: Unlocks CEF BF2-21 Frame and adds 2 to the Core Starter Set. $81,000 CAD Stretch Goal 9: Unlocks Quick Start Rulebook ebook Upgrade to a printed b&w softcover book and adds 1 copy to the Core Starter Set. $87,000 CAD Stretch Goal 10: Unlocks b&w Quick Start Rulebook Upgrade to a Color softcover book and switches the b&w copy previously add to the Core Starter Set for a color copy. $93,000 CAD Stretch Goal 11: Unlocks Caprice Bashan Mount with Aphek, Kadesh, and Meggido conversion parts and adds 4 to the Core Starter Set. $99,000 CAD Stretch Goal 12: Unlocks Caprice Acco Mount and adds 4 to the Core Starter Set. $105,000 CAD Stretch Goal 13: Unlocks CEF BF2-19 Frame and adds 2 to the Core Starter Set. $111,000 CAD Stretch Goal 14: Unlocks Northern Ferret Gear and adds 1 to the Core Starter Set. $120,000 CAD Stretch Goal 15: Unlocks CEF BF2-25 Frame and adds 1 to the Core Starter Set. $130,000 CAD Stretch Goal 16: Unlocks Southern Sidewinder Gear and adds 1 to the Core Starter Set. $140,000 CAD Stretch Goal 17: Unlocks Northern Tiger Gear and adds 1 to the Core Starter Set. $150,000 CAD Stretch Goal 18: Unlocks Southern King Cobra Gear and adds 1 to the Core Starter Set. $160,000 CAD Stretch Goal 19: Unlocks Northern Kodiak Gear and adds 1 to the Core Starter Set. $170,000 CAD Stretch Goal 20: Unlocks Extra Weapons Sprue and adds 1 to the Core Starter Set. If you want to see more about the Kickstarter, click the following link to our DP9 Forum Post with all the details. Please help us get the word out, by sharing with friends and on social media.